You need to report some numbers related to your business AND have some evidence to back them up (receipts, bank statements, etc.). How you add up the numbers is up to you! The numbers (eventually) get reported on the Schedule C. If you use software or a tax preparer, they will ask you questions, then put those numbers onto the Schedule C for you. Consider using the handy worksheets below to keep track of your numbers. ProTip: Print the Calculate-Basic worksheet, and just start filling in what you know. Then come back to the post for more ideas when needed. ProTip: Get a friend to help you with this. They can read the instructions, then together, you can figure out how to proceed. The Calculate-Basic includes everything you need for MOST situations. 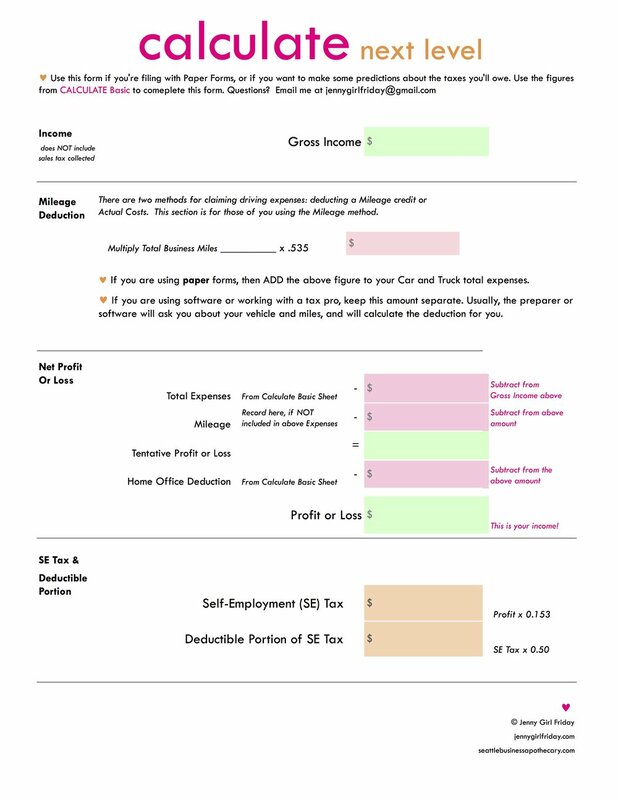 The Calculate-Next Level is helpful if you're planning to file using paper forms, or if you want to predict your self-employment tax amount. Important: This number NEVER includes any sales tax collected. You need to have a total Gross Sales number, and a record to back this up. Perhaps you already have this total, or parts of it.......or perhaps you have to create it still. Here are some options. Ideally, include the date, purchaser name, and amount of each. Add up all your numbers to find your Total Payments by customers. This is your Gross Sales. Do NOT include any sales tax collected. Did you get any 1099-MISCs or 1099-Ks for your business? These are simply proofs of payments that someone else made to your business. The numbers on these forms should already be included in your Gross Sales amount. > If you're filing with Paper Forms, then you just report your Gross Sales, which includes the totals on these forms. You do NOT need to list out their amounts separately. Okay, options! Here are three of my favorite. There are more options and variations. Hopefully this will give you an overall idea, and you can create something that works for you. Note: For evidence of our business expenses, receipts from the purchase are best. The IRS will also accept bank and credit card statements. 2. Make piles with your receipts in each category. 3. Add up the totals for each, and fill in the chart. Perhaps write these amounts on pieces of paper to keep track, one for each category. 4. Suggested: staple each stack of receipts together. 2. Get a piece of paper for each category, label at the top. 3. Go through Bank Statements. Find each business expense. Highlight, circle, or underline it on the statement. 5. When all expenses have been recorded, add up to get the totals. Record on the Calculate-Basic worksheet by category. 3. Go through your receipts and Bank Statements. Find each business expense. Highlight, circle, or underline on the statement. 4. Decide which category the expense falls in. Add it to the column or the tab. 5. When all have been recorded, add up to get the totals. Record on the Calculate-Basic worksheet. 5. Look at the report. Review each category. 7. Print the Profit and Loss statement. Or, record the amounts on the Calculate-Basic sheet. These get calculated in special ways, so deserve their own section. There are two ways to deduct driving expenses. For each vehicle, choose one method and stick to it each year. With this option, you collect and report ALL costs associated with your vehicle: gas, insurance, repairs, maintenance, and tab renewals. If you use it part for personal and part for business, you need to calculate what percentage is used for business. Then take that percentage of the total costs. So, if you use for business 30% of the time, you'd deduct 30% of all costs associated with that vehicle. Add this expense to the Car and Truck Category. For every mile that you drive for business, you get to deduct a specified amount. In 2017 it was 53.5 cents per mile. With this method, you need to know your total business miles. Additionally, you're required to have a record. The easiest way is to use an app, such as MileIQ. Or, you can keep a log book. A. Calculate Total Business Miles x 0.535 =____________. If you have a home office that meets certain requirements, then you can make a deduction. There's a Regular Method (that's complicated) to do this, and a Simplified Method. I will only speak to the Simplified Method. To learn more, go to IRS.gov, or ask your accountant. A. Decide if you meet the requirements: the space is ONLY used for business, and it is your principle work space. B. Measure the Square Footage. D. If using Paper Forms, claim this expense on the Schedule C on Line 30. (It is in a separate place than other expenses.) Also, consider researching or asking someone about Schedule A. I have yet to learn about this. E. If using software or working with a tax pro, input when prompted. ♥ If this is your first year..........hang in there........and just try your best! If you find out in the future that you did something wrong, or forgot some major deductions, don't worry, you can amend tax returns from previous years. Actually, that goes for everybody. Just try your best. Take things one step at a time. Do what you can. Reach out for help: from a friend or colleague, email me, meet with a tax volunteer at the library, or your bookkeeper or accountant. To read about options for Filing, click here. For the next Tax Help Pop-up Shop, click here.